What do we mean when we say "Extreme Services"
In the demanding Internet field, a web hosting company must not just stay at classic hosting solutions but be able to offer more. IpHost is one of the most innovative companies and always distinguishes by offering what nobody else can: Unique installations and solutions to serve even the most demanding! Do you have high requirements? We have the perfect solution! If your website has very high (extreme!) requirements in resources and constantly causes heavy load on server, we can provide you the most suitable solution for you! Considering all parameters like performance, availability, cost and ease of management, we proceed to requirements evaluation, analysis and design of the architecture that will serve you best (database to separate server, load balancer etc). Downtime is the period of time when your system is not available for use or is unresponsive. High availability is a characteristic of a system, which aims to ensure an agreed level of operational performance, usually uptime, for a higher than normal period. Since downtime can cause a company huge losses, as all their services are put on hold when their systems are down, you need to make sure your system is configured to handle different loads and different failures with minimal or no downtime. Come to us to discuss a High Availability solution for you. Virtualization Infrastructure installation with the ability of creating new Virtual Machines (VM) automatically (Auto-provisioning). Advanced technologies and technics of auto-provisioning. Are you interested? Ask us! 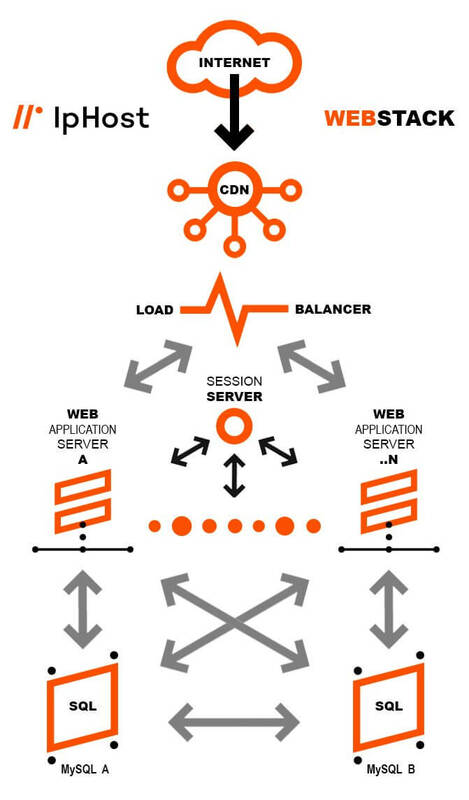 Load balancing is a key component of highly-available infrastructures commonly used to improve the performance and reliability of web sites, applications, databases and other services by distributing the workload across multiple servers. Load balancing is dividing the amount of work that a computer has to do between two or more computers so that more work gets done in the same amount of time and, in general, all users get served faster. Load balancing can be implemented with hardware, software, or a combination of both. A Load Balancer is a device that acts as a reverse proxy and distributes network or application traffic across a number of servers. On the Internet, companies whose websites get a great deal of traffic usually use load balancing. Do you have a great deal of traffic? IpHost will set your Load Balancer up! A cluster includes two or more physical servers, called nodes, ideally with identical configuration. One is identified as the active node, on which a SQL Server is running the production workload, and the other is a passive node, on which SQL Server is installed but not running. If the SQL Server on the active node fails, the passive node becomes the active node and begins to run the SQL Server production workload with some minimal failover downtime. Is the availability of your SQL Data critical for you? We will set you up a SQL Cluster! If you are looking for an infrastructure that will provide you increadible website speed, the combination Nginx php-fpm redis is for you! Nginx web server, proven and commonly accepted to be quicker and lighter than Apache with php-fpm installed are by themselves a light combination that offers exquisite performance for “heavy” websites. In this combination, add a redis server, a powerful and fast caching and data storage engine and you will have an even better and faster infrastructure. A Web stack is the collection of software required for web development. At a minimum, a Web stack contains an operating system (OS), a programming language, database software and a web server. One of the most most well-known web stacks is LAMP (Linux Apache MySQL PHP). Below you may view IpHost Web stack solution combining with CDN. Are you interested?